We all know kids get antsy after spring break. They are paying attention to you like squirrels at a rave because summer is next. But your job is to educate…so it’s time to get creative. Enter: The Indoor Classroom Garden or Sky Garden! Copy and share the list here. Add me as a friend for more templates. Caution: You may like it so much you’ll hang a garden in your own space. An easy purchase away. Go to this list, copy it, for yourself or share it with the parents for easy donations. Adjust the quantities for your classroom. Have the students cut their recycled bottles 2/3 of the way down from the top— the part with the cap of the bottle will be the new planter. Feel free to use the bottoms of the bottles for additional planters, or send them to the recycling bin. Hole punch four holes around the tops of the planters. This is where the string will tie to the planter for hanging, so make them as evenly spaced as possible. Begin planting! Fill one-third of the planter with loose, clean, gravel or small rocks. This will allow for plenty of room for drainage in case of overwatering. Add starter plant of student choice, and pack in sides and top with remaining soil. Have the students pick a partner to help tie hanging string to their planters. 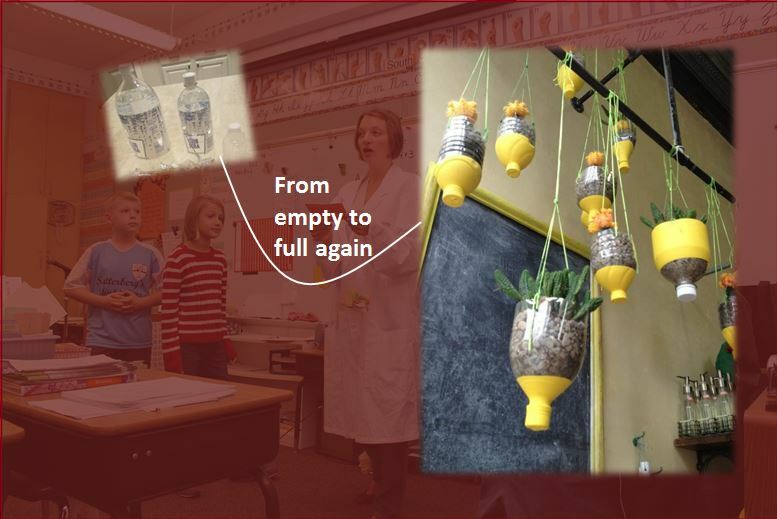 Use various size bottles so students can plant succulents and/or herbs. The small bottles are great for sprouting bean seeds. Easy for younger students to cut and fill. Mid and large bottles could be used to grow a lettuce or celery stalk that was going to be thrown away or to grow garlic or green onions. Look further in this list for a link. 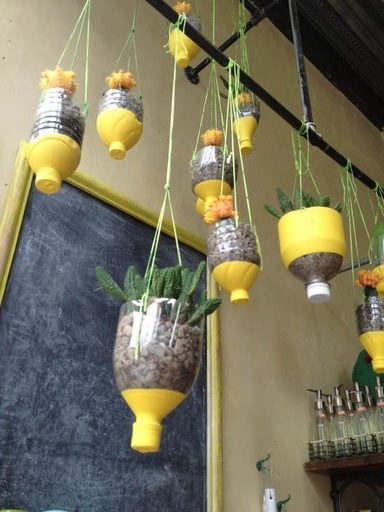 Plants can be hung on a suspended discarded shower rod by placing the ends on blocks. The planters can easily and quickly be moved in the classroom. They could also be placed at eye level so students could measure and make observations with ease. OR, as in this picture - hung on exposed water pipes in an older building.